Seniors Flex Creative Muscles In Retirement Arts Colonies Some famous writers, painters and musicians have done some of their best work in their later years. But at a pair of retirement communities in California, older people are proving that you don't have to be famous — or even a professional artist — to live a creatively fulfilling life in old age. Some famous writers, painters and musicians have done some of their best work in their later years — impressionist Claude Monet, for one. But at the North Hollywood Senior Arts Colony, older people are proving that you don't have to be famous — or even a professional artist — to live a creatively fulfilling life in old age. With a fully equipped theater and painting and sculpture studios, there seems to be rehearsals or exhibitions of some sort going on here all the time. Resident Nailah Jumoke, 64, moved here all the way from her home in Chicago. "I was looking for a place where seniors weren't being treated as seniors," she says. "As an artist, I needed to be around motivation." The move was affordable because some of the apartments here are subsidized, and Jumoke lives just on Social Security. Her experience here has exceeded her expectations. She'd done some theater before, but she was never a writer. Now, she is. "So I'm learning some new things in my senior age," she says, "and being a part of this community is helping me to see that I have a lot more inside of me ... as far as creating." This is no surprise to Tim Carpenter. He founded an organization called EngAGE that's been providing arts programs at retirement complexes for years. But his efforts were limited because most retirement homes just didn't have enough space. "When you get handed a building that has one club room, and you want to do more than one thing, it's almost impossible," he explains. "The idea of somebody watching television and having a poetry class are at odds with each other." Then, he happened to meet a developer named John Huskey. He's president of Meta Housing, which builds a lot of apartments for seniors. And Carpenter asked him why so few of his residents were participating in activities. Huskey would say, "Well, wait a minute, I build good quality housing, aren't I done?" Carpenter's answer: "I don't think so." For a while, the two men had a contentious relationship. Huskey says that changed one day when he asked Carpenter to try to figure out why one of his projects wasn't getting many tenants. So Carpenter suggested offering a writing class on-site. He says "it was very quiet — and then the laughter started." Huskey says, "It didn't take long before [the] worst idea I'd ever heard was the best idea I'd ever heard because it really, really worked." So they decided to design new buildings with spaces for things like writing classes, painting and performance. The building in North Hollywood has a professional acting company in residence at its theater and company members work on projects with the residents. There are also painting and sculpture studios there, as there are at another senior artist colony in Burbank, Calif., that opened in 2005. Recently, staff members at the Burbank Senior Artists Colony were hanging paintings for an upcoming show. These exhibitions are important, says Carpenter, because residents shouldn't just dabble. They need to have a goal, he says, "to have expectations be high and for people to take risks as they get older — instead of saying, 'Oh, you're old now, we don't expect you to do anything. If you could just sit here...' "
Research shows that there's a positive impact on older people who create art: they're healthier, they're happier, they're more likely to stay mentally sharp. Scientists say that more studies are needed, but Buster Sussman, 86, seems to be living confirmation of the studies done so far. 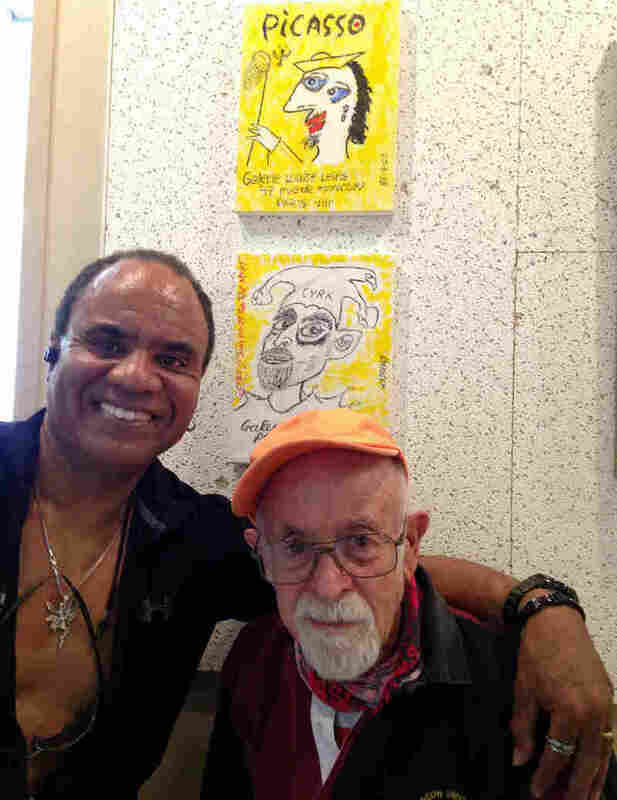 Two of his paintings are hanging in the show. They're faux advertisements done in the style of Picasso. The former real estate reporter only started painting recently and gets a kick out of seeing his work hanging on the wall. "I'm vain," he explains. "I'm a total fraud as an artist, but you can be vain and a fraud at the same time." An artistic fraud, maybe. But his self-deprecating wit is as authentic as it gets.